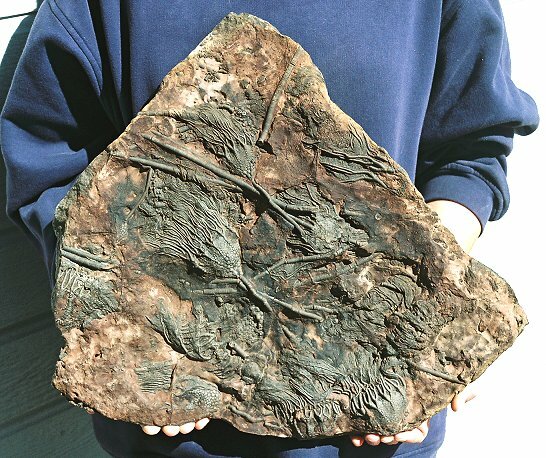 Size: Plate is about 16" X 18"
This is simply an amazing plate of crinoids. These are Scyphocrinites sp. from the Silurian of Morocco. There are at least six examples of this crinoid on the extremely large slab (well over a foot long AND wide!) This type of camerate crinoid has a huge cup composed of many stellate plates and long, multi-branching, uniserial arms. The detail of these inflated crinoids is just spectacular. The beautiful plates of the cups are very apparent, and the long arms are extremely well defined. The fine, feather-like pinnules are preserved on the arms, which is quite unusual. Several of the specimens have long stems attached. The dark gray color of the echinoderms contrasts well with the reddish-brown matrix. The crinoids are wonderfully presented on the HUGE plate of limestone that contains many, many other crinoid fragments. This is one of the most impressive multiple plates of African crinoids that we have had - perfect for a museum display.